We still have more information to share about upcoming feature changes, but it may be a few more days. Stay tuned. In other words, the incredible Global Challenge, the Youtube-centric Travel event, the gotta catch them all hype the community is currently in — all of that, albeit great, is not the news that John Hanke, Niantic’s CEO, hinted last week (see article Niantic officially doubles down: more Pokemon GO news next week and 100% commitment on delivering new features). We were under the impression that the Pokémon GO Travel event was the news we were promised, but there is apparently more coming. If you’ve payed attention to the announcement wording, it now seems evident that the news will contain something significant and gameplay focused. The word “features” in Niantic’s publishing lingo almost always means “gameplay elements and systems”, not content updates or new Pokémon. Maybe we’ll see the removal of EX Raid invitations. Maybe they’ll announce that abilities are coming with Gen III. Maybe they’ll reinvigorate the competitive spirit with a form of PvP. If you’d ask us to put money on a feature, we’d say PvP, but don’t quote us on this. We’re in the dark same as you are. However, we are feeling cautiously optimistic. With the recent uplift in community and influencers engagement, the “we’re 100% committed” announcement and the relatively soonish release of Gen III (probably less than a month away! ), we can’t help but admit one thing: we firmly believe that 2018 will be a strong year for Pokémon GO. Fingers crossed we’re not wrong. Now stop slacking and go out catch some Pokémon — we’ve got a challenge to complete! P.S. NianticIndigo made sure everyone sees this response and commented it three times in various different reddit threads. Accident? Hardly. Click the image for full resolution, we purposely include low res here in order to save your mobile bandwidth. 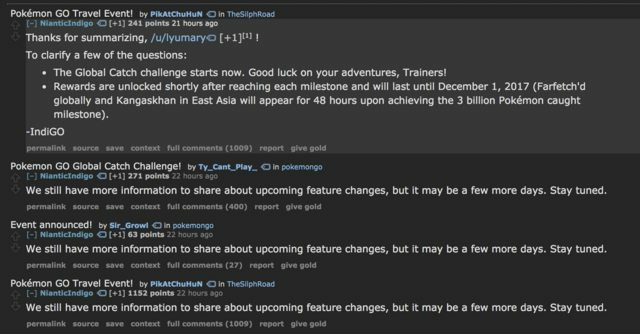 The post Niantic officials: We still have more information to share about upcoming feature changes appeared first on Pokemon GO Hub.